If you would have told me a few weeks ago that I’d now be invested in helping a pack of squids of varying shapes and sizes thwart an oozy corruption hellbent on destroying their homeland which, by the way, just so happens to often be on the backs of massive turtles delicately weaved through the ocean’s deep, I would have thought that you were crazy. Heck, I still think I’m crazy for what I’m about to say about this game. The studio, The Game Bakers, first released Squids Odyssey to the 3DS and Wii U before bringing it aboard the Switch train on July 5th. The game is actually a compilation of the studio’s first two games that were released on mobile and PC platforms starting way back in 2011, Squids and Squids Wild West, with some additional content thrown in the mix. I can already sense some people’s eyes glazing over, spouting “I’m already tired of your cephalopodic nonsense” and “who cares about mobile ports,” but I implore you to stick around. I really had little to no expectations of this game, and now I’m here to report to you my findings and experiences therein. Squids Odyssey is a strategy RPG thats meat gameplay relies on a billiards-like mechanic utilized through your party of up to four squids, which are comprised of one of the four classes, each with a unique ability. Shooters have the ability to attack from range, Scouts can dash after performing a standard move (but only before they come to a complete stop), Troopers are able to perform an AoE ground smash, and Healers can, you guessed it, heal other party members on contact. While most of these special actions can only be performed a finite amount of times per round, each squid is also capable of performing a standard movement and attack action. Both your base movement and attack commands are executed by slinging your squid companions in a billiard-like fashion across the map. Making contact with an enemy in this way will damage them, with the actual numbers depending on the impact intensity, environmental effects, statistical comparisons, and so on. Combat unfolds in a traditional, turn-based approach that we all know and love. If you don’t like that, you can get out! What I love most about combat in Squids Odyssey is the fact that the options are simplistic, yet are all meaningful. In most cases, you will use your entire toolset each round, and feel accomplished in doing so rather than ignoring a plethora of suboptimal choices each go-around. That is all before environmental factors come into play as well, which add another element of strategy to each situation. You have to be weary of areas with no wall supports (you fall, you die…somehow), water currents, and sea urchins. But keep in mind that these hazards can be used to your advantage also, as your enemies are just as susceptible to them as you are. All of these things combined make for encounters that are almost always exciting in some way. So, you can launch squids across a map and make them collide into stuff, but is there anything else? Squids Odyssey is not for those looking for a variety of content. While main objectives and challenges on maps can vary from place to place, they all follow roughly the same gameplay loop in the end. In other words, if you aren’t hot and bothered by the potential in its combat system or the challenges each level offers, then Squids Odyssey might come more as a disappointment to you than anything else. The additional map challenges mentioned earlier can be achieved all at once or individually, meaning that you have the potential to 100% a level on your first run while more difficult challenges may have you repeating the same map a few times over to finish it up. However, once you complete a challenge within a map, it is unlocked for good (ie. subsequent returns to the same map allow you to focus on the remaining challenges rather than having to do them all over again). To make things even more digestible, each level is a fairly compact experience and typically only takes a few minutes to complete. Even if you have to repeat a map multiple times to tie up those loose challenge ends, it never seems like a chore due to its core design. And while you can certainly skip any or all additional map challenges, it is the main and ultimate source for pearls, the in-game currency. The plunder you hoard throughout your adventures goes toward leveling up and unlocking new squids, equipment, and consumables for your gang. Both level ups and equipment offer permanent bonuses to the usual RPG stats like health, attack, and defense. If you’re taken aback by the whole permanent bonuses from equipment deal, then let me explain further. When a party member equips gear, it binds its stat bonuses permanently to the character, allowing you to switch freely between any unlocked item to suit your own, strictly cosmetic, tastes. While I appreciate the freedom of choice in terms of character aesthetic, the whole equipment binding system is a bit odd, especially as you collect pages of gear. It can get a bit cumbersome when you have to re-click every unlocked item to reap its rewards on every new squid you decide to use. While on the topic of new squids (aka new party members), I never found a huge reason to swap to new characters after having invested deeply in my first group. Since leveling up costs pearls, it is hard to tear away from your initial group seeing as you’ve already poured a lot of funds into them. From what I can tell, new squids don’t offer anything unique, with the exception of some slight variances in their stat growths. Luckily, if you do decide to swap out your squad from time to time, they can re-bind any previously purchased equipment, instantly reaping those rewards once again. All in all, progression feels rewarding enough keep you invested for quite a while. 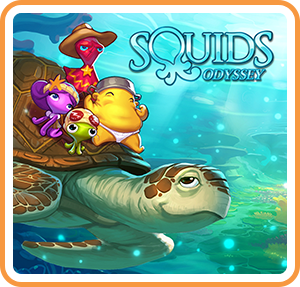 At first glance, Squids Odyssey looks very much like a cute mobile game that only your kids would play (and would make fun of you for playing). It has grown on me a lot though, which I think has to do with its unique setting and art style. If I’m being honest, I’d be hard-pressed to think of many games that take place in the ocean, and even fewer that are actually worth playing (no, Ecco the Dolphin does not count). It just goes to show you that any title, regardless of setting and art direction, can turn out to be a surprising treat. While there is no voice acting, each squid has a collection grunts that will be heard here and there between dialogue exchanges. Coming from a JRPG background, I’m used to hearing excessive grunts, and almost always being annoyed by their usage saturation. I went through most of my playtime without even noticing it, which is a good thing. If anything, they added a little flair to the squids you befriend. The music varies from your standard seaside fanfares to more generic tracks, sharing the subtlety trait of the other sound effects (ie. not being annoying or terrible). Overall, the sound design is nothing to write home about, but does a decent enough job while not getting in the way of more important things. As you’d probably expect, Squids Odyssey is rock solid when it comes to performance, and plays exceptionally well both on and off the dock (though I preferred the dock). The ability to use the touchscreen in handheld mode is a nice addition, especially with those shots that require a bit more finesse than your joy-cons can handle. I didn’t enjoy playing some of the harder challenges undocked because I felt like my fat fingers couldn’t achieve the degree of precision that some of scenarios required. So, sausage fingers beware! I know it’s the cool thing to hate on games that come from a mobile phone background, but I really was unable to find much to criticize in the package that is Squids Odyssey. There’s a lot to like (and some to love) about it as a whole, especially to those who want to experience an interesting take on tactical combat, and can see value in its massive library of compact, repeatable maps with multiple challenges. I think its offerings will appeal most to those looking to clear a few levels here and there, making it a great fit for the Switch and its innate pick up and play mentality. That’s not to say that binging through all of its levels is an impossibility though (but definitely not for me). At the price, you’ll find it difficult to deny the appeal of its underlying systems despite not offering a vast variety of content. I mean, come on! Coherent squids with little hats, people! What’s there not to like here? !